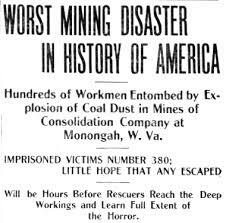 BRIDGEPORT, W.VA. – It was 107 years ago that the greatest coal-mining disaster in United States history occurred not far from here. Such human tragedy, unfortunately, left many lessons unlearned. It was less than five years ago that 29 miners will killed at Massey Energy’s Upper Big Branch-South mine (UBB). Just as miners were changing shifts in mid-afternoon on April 5, 2010 at the UBB coal mine, an explosion roared through the mine. Instantly, the 29 miners working for Massey Energy were dead, families were devastated and communities of southern West Virginia were forever changed. When the explosion occurred, 19 coal cars (each loaded with two tons of coal), being pulled out of the bowels of the mine broke free and crashed 1,300 feet back into the mine portal. The runaway cars broke lose electrical wiring, destroyed structures and ultimately disrupted the ventilation system. “At that instant, from deep within the mine an explosion rumbled, a terrible explosive report rocketing out of both mines, rippling shocks through the earth in every direction. …A second explosion followed immediately, and at the No. 8 mine entrances explosive forces rocketed out of the mine mouth like blasts from a cannon, the forces shredding everything in their path” (McAteer 116). Even though an exact cause was not immediately known or even determined, it was not long before the miners themselves were made the scapegoats. Fairmont Coal Company President C. W. Watson immediately capitalized on the anti-immigrant feelings of the time, telling the New York Times almost immediately after the disaster that “…he could not account for the ignition of the dust unless it had been through careless use of an open lamp” (McAteer 158). We know we should learn from history. Yet, as we consider the human suffering inflicted upon the people of Monongah 107 years ago, and upon those of Upper Big Branch, Farmington, Buffalo Creek, Sago, Blair Mountain, and countless other communities since, we must conclude that we have not. This should give us pause – and a cause. NOTE: This is an excerpt from “A Failure of Will: A Century of Death in the West Virginia Coal Mines.” Read the full article here. On June 20, 1863, West Virginia became the nation’s 35th state. It was the only state born out of the Civil War. That legacy of birth in our nation’s greatest internal conflict has dominated the state’s history and continues to this day. In short, West Virginia was – and is – a state of divided loyalties. While a state comprised of intensely proud and independent-minded people, its progress has been largely hindered by these ongoing conflicts of loyalty. Indeed, this history calls into question the state’s motto – Montani Semper Liberi (Latin for “Mountaineers are always Free”). An honest exploration of the state’s history is a study in outside forces raiding the state’s natural resources, even as those who labored to harvest those resources were left in and remain in poverty. From the removal of virtually all of the state’s virgin forests in the late 19th and early 20th centuries, to the proud but mixed history of coal mining, to the current debate over the benefits and harm of natural gas fracturing (fracking) are all causes for the divided loyalties. However, this conflict of cultures began even before the state’s founding. A brief look at the role played by prominent citizens of Harrison County during the Civil War illustrates just how nuanced the history of the 55-county state – and the only state situated entirely in Appalachia – is. Thomas Jonathan “Stonewall” Jackson, one of the most revered generals of the Confederacy, was born in Clarksburg, the seat of Harrison County. Born on Main Street in 1824, Jackson graduated from West Point, served in the Mexican-American War and then began a career as a teacher at Virginia Military Institute in Lexington Va. It was there that he was working and living when the Civil War started in 1861. He immediately sided with the South and was famous in short order for his brilliant and determined military strategy. His legacy as a hero was forever cemented upon his death from friendly fire in May 1863. Just one month later, the region he left behind was formed as a Union-friendly state. Ironically, it was also Harrison County residents that were among those most responsible for the establishment of West Virginia. John S. Carlisle and other Harrison County leaders were among those who led the Wheeling Conventions (May and June 1861), which ultimately repealed the Ordinance of Secession passed by Virginia. Two years later, West Virginia was a state, established by proclamation of President Abraham Lincoln. The history of divided loyalties had begun. Even more recently, the introduction of fracking, especially in the northern regions of the state, has created significant divisions. There is no disputing that the gas industry is providing the region with many decent-paying jobs. For an area that has been economically depressed for more than 40 years, these jobs are welcomed. Yet, fracking is not without consequences. The neighboring state of Ohio, for example, is presently studying the process as a man-made cause of earthquakes. In addition, questions remain as to whether ground water is impacted by the process. Furthermore, the weight of the tanker trucks and other heavy equipment required for the process are ruining roads throughout the region. It also makes for dangerous driving on narrow roads. Finally, the question of mineral rights is causing conflict, as fracking companies are benefitting from laws that allow them to extract gas from land despite landowner’s objections. Sandwiched in between the Civil War and the current “War on Coal” (as described by coal interests) are numerous examples of conflicted loyalties. Perhaps the most famous is the West Virginia Coal Wars of the early 1920s. Coal miners, upset with conditions in the coal mines and company-owned towns and stores, broke into open revolt, leading to The Battle of Blair Mountain. Ironically, a modern-day Battle of Blair Mountain continues over MTR. Another mining disaster in the winter of 1972 along Buffalo Creek in southern West Virginia left at least 125 people dead, another 1,100 injured and at least 4,000 homeless. Additionally, the state has a long history of mine disasters, the most recent being at Upper Big Branch in Raleigh County. This history of conflict – in particular over the benefits and harms of coal mining – was captured beautifully by West Virginia native Kathy Mattea on her CD, “Coal.” Anyone who has been blessed to hear Ms. Mattea perform from this work understands just how conflicted the people of the state are. The jobs are welcomed – and needed. The thousands of deaths in the coalfields and the environmental destruction are not. So, today, all throughout the Mountain State, people will celebrate its birthday. I will too, in my hometown of Clarksburg. I will do so, however, with a conflicted heart. I am sure I am not the only one.